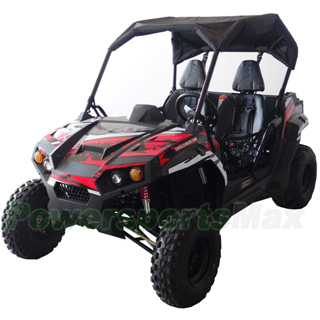 UTV 150CC, Automatic Transmission w/Reverse! Electric Start! Original Factory Package (FREE)Assembled Version (+$250.00) What is fully assembled & PDI? 150cc Air-cooled engine designed to prevent overheating. There will be no worries about overheating or extra engine maintenance with this bike. CVT Automatic Transmission gives more convenient handling for you. The Reverse feature allows you to move your bike backwards with ease without you having to get out. Chain/Dual wheel drive: This UTV comes with Chain/Dual drive. Overall size: 98" length, 48" Width, 60" Height provide a roomy and comfortable riding. Beefy front 22X7-10 and rear 22x10-10 tires offer excellent traction and help boost ground clearance. Front and Rear hydraulic Disc Brakes giving it that extra advantage of being able to stop quicker and more effectively. The UTV 150 is a Utility Vehicle (UTV) with a Air-cooled, 4-stroke engine. The 8.2hp/7500rpm Horsepower, 4-stroke engine presents excellent power over a medium class vehicle in a light weight, full-sized UTV while the air cooling provides excellent wear characteristics and thusly, longevity. The UTV 150 has a CVT automatic transmission with Reverse. Front suspension is a Independent Dual A-arm suspension and Rear Double Oil Damped Shock. The UTV 150 Utility Vehicle comes standard with hydraulic disc brakes to provide all the stopping power you might need on the ORV trails or job site. Rack and Pinion steering making maneuvering this machine smooth and easy. A heavy duty front bumper provides protection to components and to the passengers. The UTV 150 design incorporates everything riders need to enjoy the great off-road fun.Why not enjoy the same experience and fun with a brand item by saving a bunch!! Shipping charge for one single unit of UV-M03 is Free (Please login to see real shipping charge for these states: Florida, New York, District of Columbia, Connecticut, Maine, Maryland, Massachusetts, Montana, New Hampshire, New Jersey, Pennsylvania, Rhode Island, Vermont, West Virginia, Delaware, etc.) , and you will get discounted shipping price if you order multiple item. Love this UTV. Exactly what we wanted. Delivery went smoothly.